Outdoor Kitchens: Still on the Way Out? Outdoor kitchens became a must-have amenity for homeowners ostensibly overnight—and fell out of favor almost as quickly. 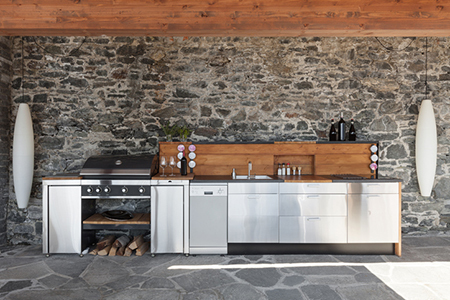 A recent survey by the American Institute of Architects (AIA), however, proves outdoor kitchens are still in. In fact, the architects cited in the AIA’s Home Design Trends Survey report an uptick in demand for outdoor kitchens in the fourth quarter of 2016. Upgrades to indoor kitchens, according to the survey, remain in-demand, as well. The most sought-after add-ons include a charging station and/or computer area, a double island, high-end and/or under-counter appliances, and sensory faucets. Bathroom improvements are also high on homeowners’ priority lists, with a door-less shower, radiant heated floors and a water-saving toilet the most popular additions.